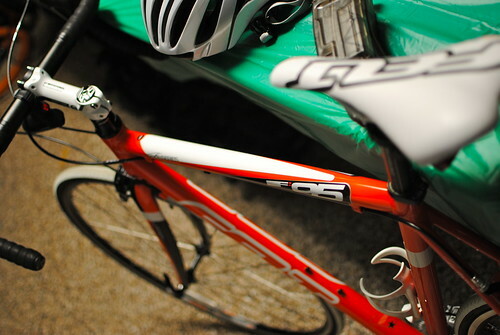 I just purchased a new road bike, Felt F95. Should be here on Tuesday. In the future I'm going to look into MTBing again, and maybe pick up something cheap like a Scott Aspect. It's impossible to ride a road bike over here, the streets are full of holes, cracks, etc. I have an old one, hanging at the garage. I used to race when I was in college on the NCCA circuit in SoCal. And spent part of a summer racing in CORPS in colorado. Riding from Crested Butte over Pearl Pass in the summer is pretty epic. This was years ago. My team was sponsored by Mavic, Slime, Redlands Cyclery, Kreitler and a couple other good companies. Those were the good times I used to also test shimano prototypes because I had a reputation for being pretty rough with my stuff. Broke two frames, one was a Specialized M2 (to give you an idea how long ago that was ). the regional rep said he'd never seen an M2 broken at a weld... Anyways, they gave me a new one. I also remember testing some prototype Shimano clipless pedals so I felt like a minor celebrity at that race. I'm riding (and I use that term loosely) a Schwinn Carbon FS now. It's like 10 years old but it still works well. And I still commute to work sometimes on that super old M2 that I used to race on. I use it to go everywhere(if there's a safe place where I can leave it), band's practice, friends house, etc. I would love to go to work with it(30Km), but I don't know where to leave it, and how to take my clothes and stuff to take a shower. I used to (road) bike race until I blew out my knees. As for work, where I'm from workplaces are very bike friendly. Generally they have a shower and let you park your bike inside or at very least will have a rack outside. I've already asked for a place to leave it, or if they can build racks before spring. do you flip it upside down and turn the pedals with your hand and yell "ice cream ice cream!" hahaha, sorry had to do it. It's here. I'll take more detailed pictures another time.